When she was only 11 years old, Jen was diagnosed with a poorly understood connective tissue disorder. While most middle-school students worry about school, friends, and sports, Jen’s days were filled with surgeries, treatments, and doctor visits. Jen fought just to survive, dreaming of living the life that her peers were taking for granted. After recovering from her 13th surgery, Jen received a card and a blanket from a complete stranger. Not only did this gesture put a smile on her face, but it helped Jen regain hope during her time of need. Jen never forgot the feeling she got from that small act of kindness. This gesture opened her eyes and inspired her to do something meaningful with her life. 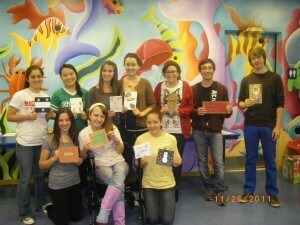 In March of 2011, Jen started an organization called Cards for Hospitalized Kids. Jen Rubino is given an Angel Shoutout for starting “Cards for Kids” – a charity which gives cards to hospitalized children. Each card is unique, just like each of the children who receive them. It may be hard to believe that a gesture as simple as a card can do so much good, but it does. We see it time and time again.